How to Clean Pretty Much Everything — What's up Fagans? Bothered by all the dirty things around your home? Here’s how to clean pretty much everything! Some people hate cleaning, avoiding it all costs, until the clutter and mess and grime drive their anxiety up enough for them to go on a mad cleaning spree to get their home in tip-top cleanliness once again. It’ll likely be several more weeks or months until certain parts of their home are this clean again. And a few people have spotless homes. All the time. Don’t ask me how they do it. I am not one of those people! (I’d like to blame the kids, but it’s not 100% their fault if I’m being totally honest). Wherever you lie on the spectrum of cleanliness and cleaning drive, it’s helpful to have the right knowledge on how to clean so you don’t waste your time using cleaning products or cleaning techniques that simply don’t work. I want to help you have a clean home and still do other things with your life. To make it easier for you to find the cleaning tutorial you’re looking for, I’ve broken all my “how to clean” tips and tricks by room starting with the kitchen! Even easier than scrolling through all of the following information is picking up a copy of my cleaning ebook Speed Clean the Deep Clean! It’s a collection of my best 50+ time-saving cleaning tutorials and tips! When you buy it, it’s easy to pick it up and find your answer to “How do I clean _____?” without having to search on Google, or run your own cleaning experiments; I’ve already experimented for you! It’s a cool $4.99 and totally worth it. So, for all of my best cleaning tutorials in one easy to use and reference resource, be sure to check out my Speed Clean the Deep Clean: A Collection of Time-Saving Cleaning Tutorials and Tips for Busy Moms! If you have carpet, upholstery, or soft furniture, I’d definitely add in a vacuum too. I also think a steam cleaner machine is a great cleaning tool. A steam cleaner can be used to easily remove hard water stains, clean grout, remove odors, and sanitize floors and countertops. A steam cleaner is a great chemical-free way to clean your kitchen. I found it does a great job cleaning a dishwasher too! It’s important to note that even the cleaning tools need to be cleaned out regularly to ensure they are actually cleaning, instead of spreading around more germs and grime. Baking Soda: This white substance is one of the best natural cleaning agents you can own! Plus, it’s super affordable and you can buy it just about anywhere. I’ve used baking soda for cleaning items in my kitchen, cleaning my mattress, removing rust, and more! Vinegar: Spritzing some vinegar on your hard water stains and buildup helps them disappear! Love using a little vinegar to clean your faucets, shower heads, drain stoppers, and other metal or glass surfaces in the bathroom. Vinegar is a great deodorizing and cleaning agent. I’ve used vinegar to clean copper bottom pots, clean a dishwasher, remove rust from a bike, and clean stove drip pans. Hydrogen Peroxide: Hydrogen peroxide, the cleaning agent that comes in a hard colored bottle, is anti-bacterial, anti-fungal, anti-mold, and anti-mildew! It’s also non-toxic. And it works great for a host of cleaning jobs around the entire home. I found it removed pee stains from a mattress amazingly! Dish Soap: Nothing cuts through grease and oil like a good dish soap! Most people prefer the regular blue Dawn dish soap in their cleaning recipes! Ammonia: This is some powerful smelling stuff, but man does it does Ammonia works wonders on stubborn burnt on stove drip pans, grills, remove blood stains, removes lip gloss stains, and more! Bar Keepers Friend: If you want to really shine up the chrome and whiten the porcelain sinks and tubs, use some Bar Keepers Friend. It’s one of my very favorite cleaning products and works great in the bathrooms on tubs, sinks, counters, and chrome. I also use it in the kitchen to shine up nasty stainless steel pans, to remove scratches from dinnerware, clean copper bottom pots, and clean stove drip pans. Magic Erasers: I have found that a simple Mr. Clean Magic Eraser is great for cleaning bathtubs and countertops in bathrooms. They are very easy to use as you don’t need to let anything sit or have to rinse anything off when you are done, both of which are a pain when cleaning a bathroom. Of course, they are also great when you need to remove crayon from walls. Bleach: With its ability to kill mold, germs, and bacteria, whiten surfaces, and sanitize, bleach is still an amazing cleaning agent to keep and use around the home. No one wants to be stuck cleaning forever, I don’t care how OCD you are about cleanliness. There are far more important things to do in life! That’s why it’s important to be smart about the items you buy in the first place! It’s my little secret to a clean home: only buy items that are easy to clean! If you buy lots of clothing that is hand wash or dry clean only, it’ll take you longer to do laundry. If you buy home decor that has lots of intricate designs and etched in patterns into them, it’ll take longer to dust and clean them. If you buy real silver, that needs special care every time you use it, you’re going to spend more time cleaning. Or, and you’ll also spend more time cleaning the longer you go between it getting dirty and you cleaning it. It’s true for stains (fresh stains are way easier to remove than dried set in ones! ), dishes, drip pans, windows, and a whole lot of other things. The longer something has time to build up a stain or grime, the more elbow grease and scrubbing you are likely to do to remove it later. Also, it’s helpful to know how often you should clean your house! *Download your editable household cleaning schedule here! It’s also best to clean the kitchen as you cook and use it. Take the three extra seconds to rinse off plates and dishes and put them in the dishwasher right away, rather than just put them in the kitchen sink or on the counter (and teach your kids and roommates to do the same)! Food is much harder to get off plates and silverware when it’s had time to harder on it. I generally run and unload my dishwasher every day. Actually, it’s part of my kids regular morning chores to unload the dishwasher so I don’t even have to do it myself! Doing so prevents dishes from piling up. Then I make sure that I am loading the dishwasher properly and experiment with homemade dishwashing detergent so that everything actually gets perfectly clean. Every night I make sure my kitchen is clean before I go to bed so I’m never waking up to a messy kitchen when all I want to do is eat my breakfast in peace. It’s kind of like how making your bed just sets the mood for the day – having a clean kitchen at the start of each day makes for better days too. Before I go to bed, I finish loading the dishwasher and then run it. I wash all the pots and pans in the sink by hand and set them out to dry (and put them away in the morning after breakfast). I put away any leftovers and supplies from dinner, wipe down the counters, table, chairs, and sink, and sweep the floor. Every few days I mop the floors. *Be sure to download your Free Dishwasher Clean Dirty Printable sign! Before our weekly grocery shopping trips, I try (I’m working on being more consistent on this) to go through the fridge and clean out leftovers that are no longer good and wipe down the shelves. This helps prevents fridge odors and smells from developing. I also try to get out a fresh dishrag every day in order to prevent mildew odors on dish towels and keep things more sanitary. And if you love natural cleaners, check out my list of 17 Baking soda uses for cleaning the kitchen. One of the dirtiest rooms in the house, and one that the majority of people hate cleaning regularly is the bathroom. Here’s how to clean a bathroom and not have it be so dreadful and stinky! First, keeping it tidy is again best here. I’m not perfect at this, but this means putting toothbrushes back in the toothbrush holders when you are done with them, throwing empty toilet paper rolls into the trash can instead of onto the floor, taking out the trash when it’s full (or just really stinky), hanging up towels right away, and putting dirty laundry into laundry baskets instead of in piles on the floor. It also means putting makeup, brushes, creams, ointments, medicines, hair dryers, and anything else you get out back into its respective place (which is why bathroom organization is super important to keep a bathroom clean). *Related: How to clean a curling iron and how to clean contact lenses. Your bathroom towels and mats should be laundered every week (or more often if you’re really awesome about laundry) to prevent mildew and other bacteria from growing on them and getting put back onto yourself. *Download a Bathroom Cleaning Schedule for Free! Toilets should be cleaned as needed or about weekly. This includes the outside of the toilets as well. The floors should be swept (or vacuumed – which is often easier if there is lots of hair) and mopped every week. And bathtubs and showers cleaned at least once a month, more often is better (of course) and some people spend a little time wiping down walls and doors to prevent hard water buildup and mold. Plus, check out 10 ways of using baking soda for bathroom cleaning! If you want to know how to clean stains, I’ve started working to figure this out myself! Stains are a huge unfortunate reality of life. 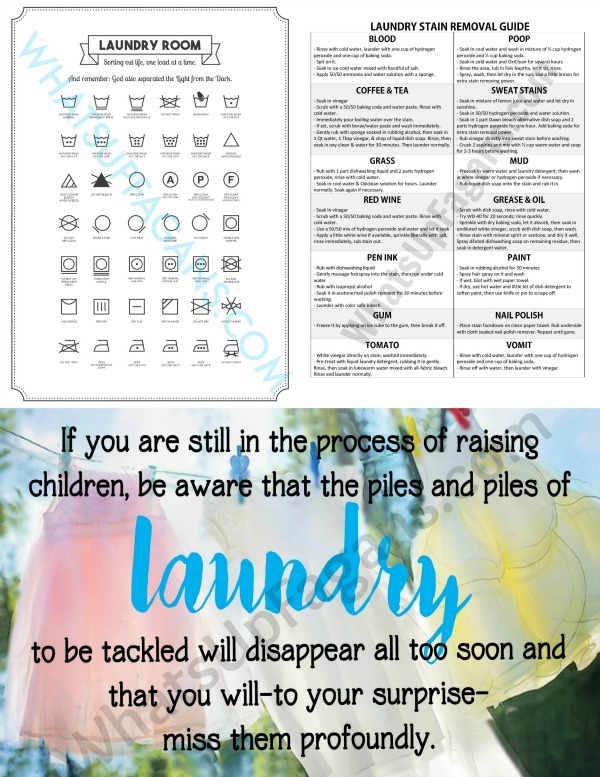 It’s why I put together a handy Laundry Stain Removal Guide as part of a few free laundry room printables! But stains aren’t always on your clothes or linens. Sometimes stains happen on your carpets, mattresses, or other places! If you’re a frugal person like myself, it can be helpful to know how to clean a car yourself, rather than pay others to clean it for you. I live in an apartment, so I found a great tip on how to wash a car without water! If you are having a baby, here are some things you need to know about prepping your car for a new baby. If you ever have the unfortunate reality of dealing with car sickness in your family, here’s how to get rid of vomit smell in a car! And here’s how to clean chrome rims at home and even remove chrome rust from your vehicle! If you are a mom, like me, cleaning goes to a whole new level of difficulty. Kids challenge the best of us to keep a home in working, let alone, clean order. It’s amazing how fast a room can go from perfection to bedlam. And that’s why we’ve worked hard to get our kids doing chores every day, starting at about three years old, and using a simple chore chart. We teach them things like how to load a dishwasher and how to unload a dishwasher without breaking anything. We also teach children the importance of cleaning up after themselves and part of that comes from the example we set as their parents by cleaning up even with the kids still awake and around. This way they know there isn’t some magic elf coming in every night to clean up the house. Be sure to check out my post on 11 habits that keep your house clean even with kids too for more help! Ultimately, there is one secret to having a clean house with kids and that’s to hire a maid as a parent! Oh, and if you happen to be a golf fan, I have one more for you – how to clean golf clubs!